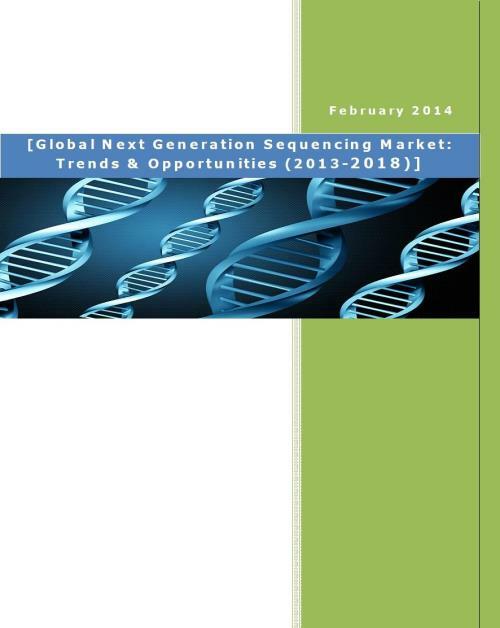 The report titled 'Global Next Generation Sequencing Market: Trends and Opportunities (2013-2018)' analyzes the potential opportunities and significant trends in the global Next Generation Sequencing market. The report also provides detailed analysis of the global next generation sequencing market, the Sanger Sequencing market and provides specific focus on the clinical diagnostic opportunities of the NGS technology. The report also profiles and analyzes the business strategies of the leading companies operating in the segment. Next Generation Sequencing (NGS) technology has emerged as a higher throughput and much cheaper alternative of sequencing DNA than traditional Sanger Sequencing. NGS can be used primarily to identify genes responsible for inherited skin disease, to detect mutations that play a role in diseases such as cancer and to determine RNA expression level. The use of NGS technology in clinical research and genome functions is constantly increasing and there are many clinical diagnostic opportunities for next generation sequencing such as in oncology screening, parental screening, Alzheimer diseases, multiple sclerosis etc. The growth of the overall NGS market is driven by continuous innovations and developments in the market aimed at higher throughput, increased accuracy, and affordable costs. However factors such as mismatch between discovery and interpretation of samples, clinical translation of genomic discoveries, difficulty in finding samples to sequence and storage of sequence data hinders the growth of the market. In addition, factors such as high reliability on grants and funding from the government are still a challenge. The opportunities for the growth of this market include developments in the pre-sequencing, cloud computing, and NGS bioinformatics solutions. Next generation sequencing technology is set to revolutionize applied markets like diagnostics, drug discovery, biomarker discovery, personalized medicine, agriculture and animals research in the near future.